Your DRUID impairment score is 50.3. This suggests you are at a moderate level of impairment… you should avoid driving until your impairment decreases. I was satisfied with the app’s assessment. (I’d taken the test multiple times while sober, and my baseline score is typically around 37.) Content to avoid leaving the house, I went inside, made a bowl of cereal, and watched the latest episode of Westworld. According to University of Massachusetts Boston psychologist Michael Milburn, Druid worked exactly as designed. “I developed the test from a careful examination of the driving impairment literature, building it around things like hand-eye coordination and divided-attention tasks that can suffer under the influence of alcohol and cannabis,” he says. His app is one in a growing group of phone-based tests designed to gauge how messed up you are. Such a test would be particularly valuable for pot-smokers, and for law enforcement in recently weed-legal states. There’s no breathalyzer for marijuana, and consumers and cops are years from having a biomarker for how ripped you are, let alone whether you’re good to hop behind the wheel of a car. So the police rely on other, observable measurements, like field sobriety tests. What apps like Druid presuppose is that such tests could eventually live on our phones, their microphones and sensors gauging not just whether we’re too high to drive, but too drunk, too sleepy, too medicated, too demented, or too otherwise cognitively impaired. The goal, in essence: A universal, phone-based driver fitness test. Researchers are pursuing the idea from all angles. At last week’s 2018’s Experimental Biology conference in San Diego, researchers led by University of Chicago psychologist Harriet de Wit unveiled a prototype app called Am I Stoned? (screenshots of which appear below), designed to gauge a user’s elevated state by assessing cognitive speed, reaction time, fine motor ability, and memory. Last September, researchers at Worcester Polytechnic Institute and Boston University received a half million dollar grant from the National Institute on Alcohol Abuse & Alcoholism for the continued development of AlcoGait, a smartphone sensing app that analyzes your walking pattern with machine learning algorithms to detect how drunk you are. 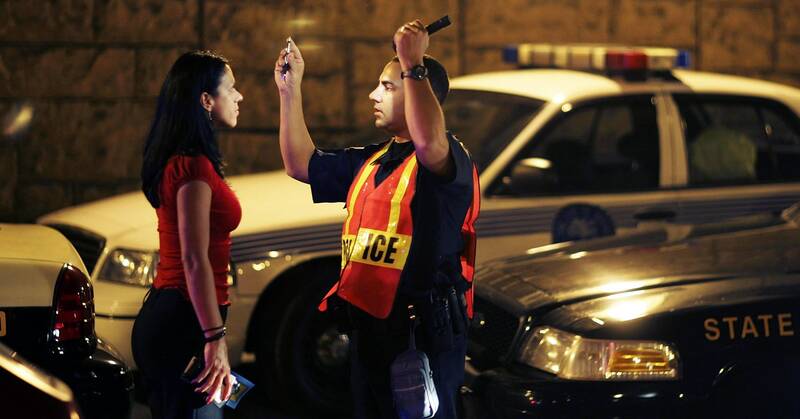 These mobile-friendly tests use your phone’s sensors to detect impairment. De Wit and her colleagues developed Am I Stoned? using ResearchKit, an open source platform Apple released in 2015 to help researchers conduct large-scale studies using ubiquitous iOS devices. “It’s a real challenge,” de Wit says, “to translate these tasks into an app.” Fortunately, Apple’s kit includes more than a dozen prefab “Active Tasks”—tests that leverage the touchscreens, accelerometers, microphones, and gyroscopes on users’ phones to test things like range of motion, balance, memory, reaction time, and dexterity—to which de Wit and her team added some custom-made assessments. Other apps, like Druid and AlcoGait, are bespoke, built entirely from scratch. What she means is that researchers still don’t know how much tapping a screen can tell you about your level of impairment, or, by extension, your ability to negotiate traffic. “The biggest challenge is going to be figuring out exactly which perceptual, cognitive, and motor abilities map onto driving performance,” says experimental psychologist Jennifer Campos, chief scientist at the Challenging Environment Assessment Laboratory. The facility is home to the iDAPT DriverLab, the most powerful driving simulator in Canada. It combines a modified Audi A3, a 360-degree projection system, and a seven-degrees-of-freedom motion system to simulate an incredible range of conditions and driving scenarios. You can drive in the rain, or stare down the glare of oncoming headlights—all in an environment tightly controlled by researchers. And while Campos declines to specify any upcoming experiments, she says you can count on the sim being piloted by stoned test subjects in the not-too-distant future. What’s more, the skills required to operate a car safely—like gauging the speed and position of other drivers, recognizing the sensitivity of your vehicle’s brakes, checking your blind spots before changing lanes—are different from the abilities required to perform those skills—dynamic visual acuity, normal motor function, and focus. Your eight year old with no knowledge of local traffic laws could probably pass a field sobriety test, but he’s got no business behind the wheel of your family sedan. Milburn, for his part, actually encourages Druid users to practice his test while they’re sober, to establish a reliable baseline score. He says he’s done his best to avoid over-familiarity by designing unpredictability into Druid’s assessment. (When testing reaction time, for example, the shapes that users are instructed to tap appear on screen in random positions at random intervals.) He’s working with police departments in Massachusetts and Washington state to further validate the test during so-called wet lab exercises, in which police cadets practice performing field sobriety tests on drunk volunteers. “But the data I’ve collected so far do not show any significant practice effects,” he says.